TrueCrypt is a software application used for real-time on-the-fly encryption. It is distributed without cost, and has source code available, although under a restrictive license and works on Windows, Linux and Mac OSX. 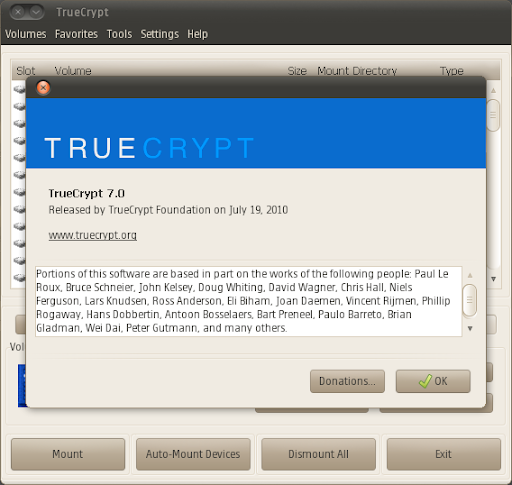 TrueCrypt can encrypt files, partition and removable media. TrueCrypt 7.0 was released yesterday with an important new feature: hardware acceleration for AES encryption which is supposed to be 4-8 times faster than encryption performed by the purely software implementation on the same processors. The H Online states that in their tests, TrueCrypt 7.0 with hardware acceleration had a performance increase for AES encryption and decryption from 287 MBytes/s to 2 GBytes/s. However, even the unaccelerated AES throughput is too fast for modern hard disks so you basically can't take advantage of this for now, but it still frees CPU resources and potentially has some benefits on battery drain in mobile systems. A complete changelog for TrueCrypt 7.0 can be found here. To install TrueCrypt in Linux, simply download the standard Linux x86 or x86_64 archive, extract it and then double click the extracted file and follow the on-screen instructions. Once installed, you can access TrueCrypt by going to Applications > Accessories > TrueCrypt. Download TrueCrypt for Linux, Windows and Mac OSX.